Emily Chubbick Judson (1817–1854) is a well-known name, but for more reasons than most know. She was a nationally known writer (her pseudonym was Fanny Forrester) with pieces appearing alongside those by Edgar Allan Poe and Walt Whitman, and she walked in literary company second to none. She wrote childrens books, essays, and stories. Then, in 1845, she met Adoniram Judson and they married in 1846. Their work in Burma made them famous as Baptist missionaries. 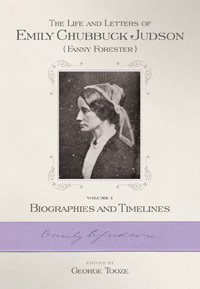 After his death in 1850, she returned to the States in 1851 and spent the last years of her life writing and publishing her essays and poetry, and helping to produce a biography of her husband. During her fascinating life, she was a prolific letter writer. This is the first volume of her life and works, with volumes 2 through 6 containing all of her letters. As these volumes are presented, readers and scholars in the future will find in this material encouragement for sharing more about the Judson lives, and the wonderful work they accomplished. Their humanity, their faith, and their deep commitment to their call should prove to be instructive and inspirational to each of our lives. Volume 1 consists of footnotes, time lines, and biographies that have all emerged out of the project itself. For example, many of Emily Chubbic Judson’s letters are undated. To put them in sequence, the events, places, and people within the letters were identified so they could be understood and interpreted correctly; this resulted in a “Cast of Characters” and “Places and Events.” The “Publication Time” puts Chubbick’s writings in chronological order. The footnotes clarify and lend context to the names and faces, as well as the stories and the events within the letters, and the connectiveness between the letters.